Changelings- Changelings are a hybrid race. A changeling birth occurs when a doppelganger impregnates a human (not the other way around) or if two changelings mate. Of the races on Atroa, changelings are the most rare. Most changelings try to pass themselves off as another race. This is due in part to the general fear and distrust of them. A few institutions (including the Church of Erathis) actively hunt changelings, diminishing their numbers even further. So the chances of two changelings meeting and mating are often very slim. Cities like Dunthrane and St. Balthas are particularly unsafe for changelings. When it comes to adaptability, changelings put humans to shame. The ability to change their appearance at will goes a long way toward survival. This inherent subterfuge gives the race a general predisposition to more nefarious practices. Which only goes to reinforce many of their negative stereotypes. The first appearance of changelings on Atroa can never truly be known. All anyone knows is that they exist and from whence they came. Changeling societies exist, in secret. Often as nomadic gypsies, or small isolated villages; the entire population passing as some other race. From very young, changeling parents teach them to hide their true nature, so that they might be accepted by the outside world. Deva- Angels that chose to live among mortals, deva are mirrors of benevolence. There are around five hundred deva on the face of Atroa. This number is a near constant. Deva are not born or created, they are immortal. Thirty years ago, when Balthas the Reaver was sainted, five hundred angels in the service of Bahamut swore to defend the city of St. Balthas. Since then some have left, temporarily, but they usually return. When a deva is slain they are reincarnated in a new body at a sacred site, usually the temple of Bahamut in St. Balthas, with enough memories of their past existences to speak and function as a well-adjusted being. Deva are a benevolent race, they seek to battle evil in all of its forms. They remember residing with the gods in the Astral Sea and strive to do the bidding of the gods of good. However, the battle against evil is not only external, every deva feels the tantalizing pull of evil in their soul. Those rare deva that do turn to evil are eventually reincarnated as a rakshasa, only then can a deva truly die. Among the five hundred or so deva there are different devotions; each good aligned god can claim a portion of the five hundred as having once been in their court. Deva usually continue to serve their deity in their mortal life. Deva appear as humans with chalk white or grey complexions and tracings of intricate lines of a darker color, usually blue black or purple, covering their bodies. Their hair is often stark blonde or the same color as their lines. Additionally, deva have a pair of vestigial wings with white or grey feathers. These wings serve no utilitarian purpose, but they are often decorated with gems and precious metals. Dragonborn- During the Cataclysm, around three thousand years ago, the god Io was split in twain by the entity known as Marduk. One of these halves plummeted to Atroa at the southern pole, creating a massive crater. As it fell, however, Io's heart crashed into the primordial earth in what is now the jungles of Esziss. From his blood emerged the burgeoning jungles and the dragonborn race. They founded the nation of Arkhosia and worshiped the blood of Io as Tiamat and Bahamut. Dragonborn appear as humanoids with strong reptilian facial features with a blunt snout and distinctive frills at the ear and cheek. Dragonborn have fine scales covering most of their bodies with thicker, larger scales at the forearm, lower legs and feet, shoulders, and thighs. They have horn-like ropy scales just behind their brows that resembles thick hair. Arkhosia has come and gone since their appearance three millennia ago, but the dragonborn city-state of Barrsza remains. Outside of their homeland, dragonborn are somewhat sparse, though larger concentrations exist in Dunthrane and Midara. As a race, they are driven and proud, with a strong sense of history. They feel a deep connection to their dragon cousins and often ally themselves with like-minded dragons. 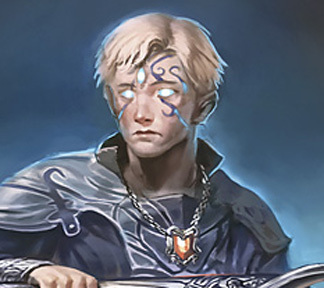 Drow- Once children of the Seldarine, drow now exist as outcast from their brother and sister races. Originally; Eladrin, Elves and Drow existed as one race, living in peace and unity in the Feywild. The gods of the Seldarine (Corellon, Sehanine, and Lolth) held them all in loving esteem, but it was the petty and jealous plotting of Lolth that twisted the hearts of her children. Millenia of bitter wars followed, resulting in the drow retreating to the underdark. Lolth was cast out of the Feywild to the deepest parts of the Abyss, cursed to exist forevermore as a demon. In the underdark the drow adhered to their dark and chaotic nature, and their societies are as harsh and deadly as the drow themselves. Lolth remains their primary deity, though some drow societies worship other fell gods or entities. Those that don't worship Lolth rarely adhere to the matriarchal societal structure. These drow cities are often viewed as heretical by their more traditional kin. 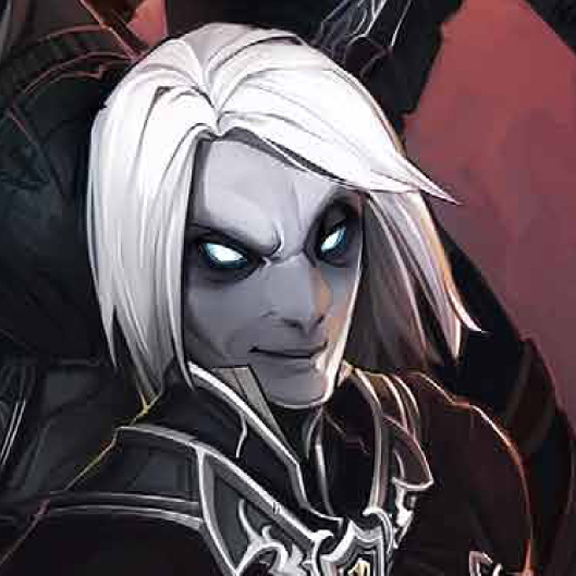 Across Atroa there is perhaps no race more feared or hated than the drow. It is rare for one of their kind to deviate from the race's evil nature. Those that do often have a hard time finding acceptance on the surface. 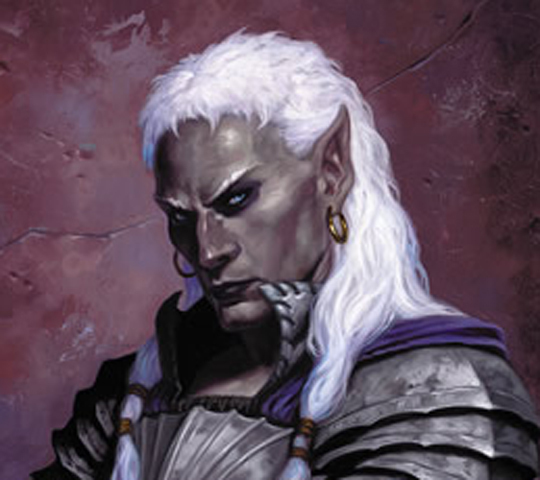 Drow appear as dark-skinned eladrin with white or gray hair and glowing eyes, most often red in color. Dark elves are shorter than their elven kin, with the males standing shorter than the females. Dwarves- There is a saying amongst the dwarves that they are "as old as the stone". In many ways this statement isn't far from the truth, dwarves are one of the oldest races on Atroa; one of the Elder Races. The children of Moradin can trace their legacy back to the Soul Forger. After carving the mountains from the primordial earth, Moradin created the dwarven race to mine their riches and create wondrous items from them. So, since almost the creation of Atroa, dwarves have dwelled her caverns. Many stereotypes exist regarding the dwarves, and much of it is steeped in truth. The dwarven people cling steadfastly to tradition and the vast majority conform (most non-dwarves would say) to societal expectations. The crafts of blacksmithing, gem-cutting, mining, and artifice were pioneered by the dwarves and so practiced best by them. But above all, the contribution the dwarves will be forever known for is brewing. Dwarven ale is among the (if not the) best ale on Atroa and sells-out quickly in non-dwarven cities. 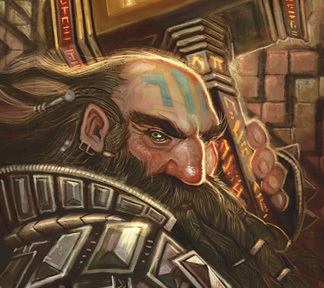 Dwarves can be found in most societies across Atroa, but none more than the Dawnforge and Stonemarch mountain ranges. Sprohm boasts the highest dwarven population outside the traditional mountain societies, and much of its ruling council is composed of the industrious race. They are a stubborn race and don't take to change well. Deviants among their race are often ostracized. Adherence to the old ways, in the dwarven opinion, is whats best for a dwarf. Eladrin- Envoys to the Seldarine, eladrin are a race straddling two worlds. 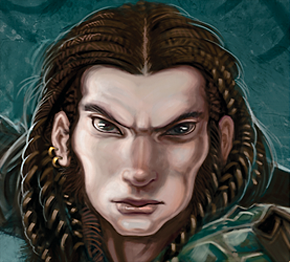 The true children of Corellon the Protector, the eladrin are warriors dedicated to the protection of the Feywild. The three great eladrin cities; Astrazalian, Mithrendain, and Shinaelestra exist only partially in this world. They slip back and forth from the Feywild at regular intervals. Astrazalian, for instance, appears on a latoral island in Iirivaumn on the spring equinox and remains until the end of summer. Shinaelestra, on the other hand, appears in the Warp Wood every midnight only to return to the Feywild at dawn. While in the Feywild, Astrazalian is engaged in constant battle with the unseelie fey. Likewise, Shinaelestra, while on the material plane, battles with the fomorians cyclopses and drow of Atroa. This strife has hardened the eladrin people. 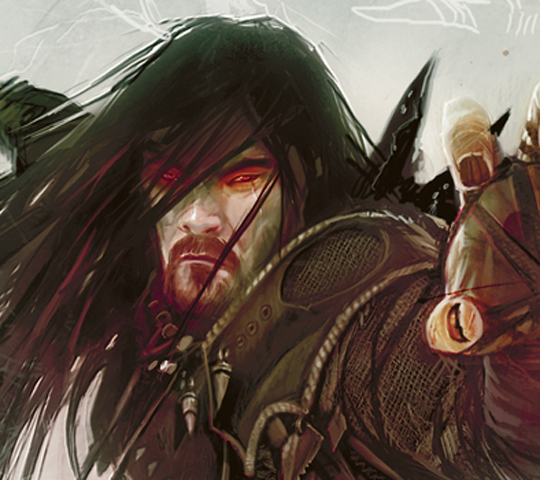 Despite their graceful exterior, inside every eladrin lies a passionate, steely warrior. Those eladrin that do live outside battle are often artisans of unparalleled skill. They create Art of both spell and song. Eladrin rarely live outside their city strongholds, those that do gravitate toward major metropolises. The eladrin way of life focuses on strong discipline and devotion; be that to sword, spell, song, or all three. 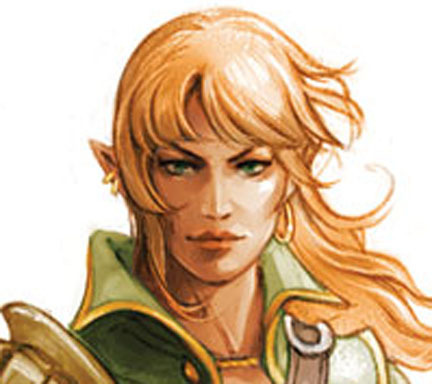 Eladrin look much the same as their elf and dark elf kin, though their skin tends to have a slight iridescent sheen and their eyes glow with pearly opalescence varying in color and lacking pupils. Their appearance can be divided fairly cleanly into two categories; Sun Elf and Moon Elf. Sun elves tend to have tanner complexions and lighter hair color, and moon elves tend toward lighter complexions and darker hair. 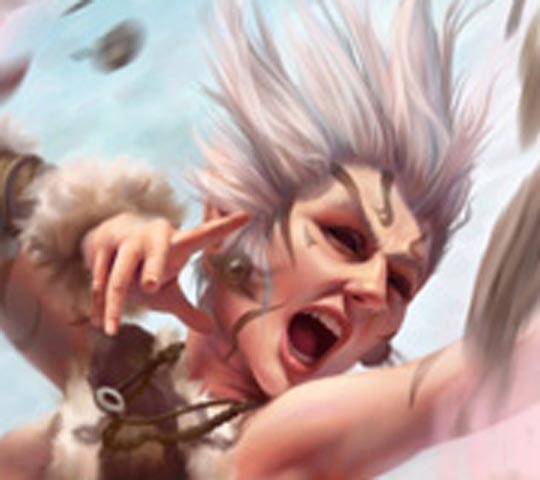 Elves- Elves are ancestors of those eladrin that chose to remain on Atroa after the Godswar. Considered the children of Sehanine, elves protect the wild places of Atroa from the likes of orcs, drow and worse. These fey inhabitants of the material world are considered to be one of the Elder Races and, like dwarves, are now in decline. The boom of the human race and the now fallen empire of Nerath has pushed elves into the distant wilds. Few elven lands remain in Atroa. Iirivaumn and Dejai are two of the more isolationist elven lands, though Iirivaumn is primarily inhabited by eladrin. Little known to most Atroans, beyond the Landscreen lies a collection of island nations ruled primarily by elves called Shima-To. It is a foreign land of very foreign traditions where elves are the ruling class race. The only way to reach Shima-To from the rest of Atroa is through Dejai (and then the Feywild), but no-one has ever found Dejai. Other elven realms include; the Winterbole Forest, the Harken Forest, the Warp Wood, and the jungles of Esziss. 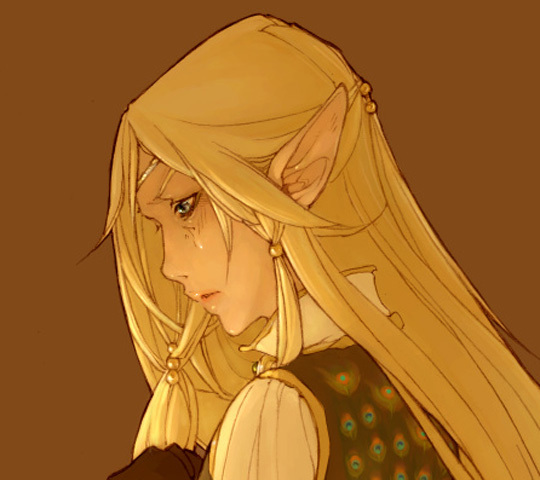 Elves are given to extremes of emotion, from delighted laughter to blinding rage to mournful tears. They are inclined to impulsive behavior, which causes other races to view them as flighty or impetuous, but elves seldom shirk responsibility or forget a commitment. Possessed of great longevity (living well over 200 years), elves live their lives in large chapters. Every couple decades an elf might simply move-on from their current situation, leaving their companions and acquaintances behind, to live a new life. This might be among other elves or a diverse collection of races and a life of adventure. Elves are slender and athletic, about as tall as humans and having the same range of complexions. Though elves are more likely to have numerous tattoos. Their hair tends toward dark brown, autumn orange, mossy green, or deep gold. Elves ears are long and pointed and their eyes vary widely in color from midnight blue to pale grey. Elves can be split further into three classifications; wild elves, wood elves, and dusk elves. This depends primarily on the region from which a elf comes and has little bearing on appearance. Genasi- Over three thousand years ago Io was torn in two and his essences plummeted from the heavens. As the story goes, Bahamut crashed into the southern pole of Atroa, creating the massive crater there and the burgeoning jungles of Arkhosia that surround it. Tiamat crashed into the sea after tearing a large swath behind her, creating both the Maelstrom and the Landscreen. 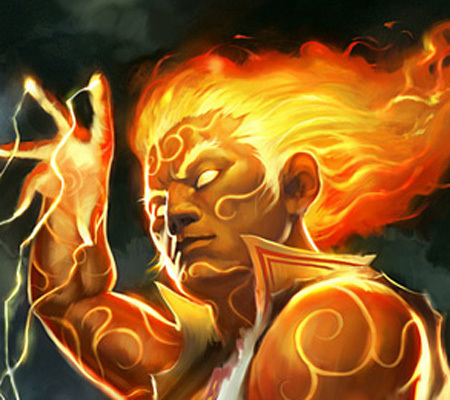 Indirectly, the death of Io is responsible for the appearance of the genasi on Atroa; a century after the cataclysm, after the Maelstrom had receded leaving behind the archipelago of Akanul, the first genasi emerged from the elemental chaos to inhabit the island society. Since then their race has ventured out into other areas of Atroa, although sparsely. Most genasi are hesitant to leave the beauty and protection of their homeland. Each manifestation of their race possess traits inherent to the elements, making their race one of the most diverse on Atroa. For the most part, this diversity is all but overlooked among their kind, they hold no particular manifestation above the others (except maybe the darker manifestations like plaguesoul and voidsoul). They recognize that, at any time, any one of them might manifest an additional element. Genasi appear humanoid in shape and somewhat human in appearance. Their skin color varies depending on their elemental manifestation, though all genasi have energy lines covering their entire bodies. These are as precious to a genasi as perhaps eye color is to a human. Watersoul, earthsoul, voidsoul, and causticsoul genasi are often bald, while the rest usually grow thick translucent hair follicles that cling statically to each other in locks that resemble crystal formations. Githyanki- Once belonging to the same ancient slave race as the githzerai, the githyanki are now a race of fierce psychic warriors whom ply the Astral Sea and wield swords of silver. Ages ago, the gith were a race enslaved by the mind flayers. After a bloody uprising, the gith were ideologically split on how they should proceed with their new-found freedom; the githzerai opted for a life of reflection and asceticism, and the githyanki sought power so as to never be enslaved again. This internecine strife persists to this day, and githyanki attack any mind flayers or githzerai on sight. They are particularly cruel to their former kin. 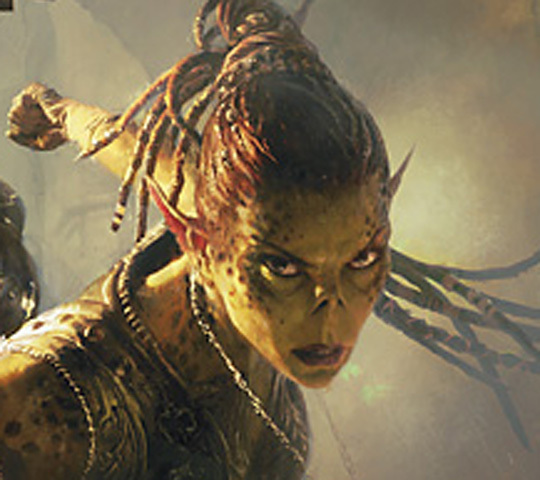 Githyanki have few dealings with the beings of Atroa. Rarely do their interests stray from the Astral Sea, but when they do it is often for the purposes of conquer and plunder. Githyanki society does not recognize a familial structure. From birth, the githyanki belong to military training groups called cadres. A githyanki views her cadre as singularly important and typically does not know the name of her parents or siblings. Even more important to a githyanki than her cadre is her weapon. A githyanki lavishes more care on her weapons than her fellows. 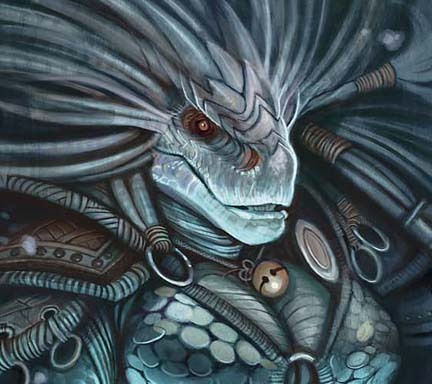 The great githyanki city of Tu'narath is built atop the body of a dead god adrift in the Astral Sea and ruled by Vlaakith, the githyanki lich-queen. Vlaakith has ruled supreme for over a thousand years, and the githyanki revere the lich-queen as the stepmother of their race. To them, her word is truth. She has a reputation for killing any who challenge her policy or power, devouring their life essences. Vlaakith, in the githyanki's centuries long quest for power, forged a blood pact with a supremely ancient red dragon. Through this powerful ritual pact (of which the specifics are lost) githyanki are sometimes able to call upon the aid of red dragons. A fearsome and all too often sight in the Astral Sea is a cadre of githyanki riding into battle on the backs of red wyrms. Githyanki stand slightly taller than humans and have slender but powerful frames. Their skin tends toward yellow tones, occasionally shading into brown or green. They have sharp features and pointed ears, as well as deep-set eyes. Their noses are flat and set high on their face. Githyanki, unlike their githzerai cousins, often wear decorative and elaborate clothing, though it often has military significance. Both males and females will often wear their dark hair long and braided with gems and precious metals. Those whom focus on psionic disciplines will often keep their heads shaved or tonsured. Githyanki are aggressive and brash. They seek power and wealth and see opulence as a sign of strength. A githyanki will often say less about something with a dozen extravagant words (and insults), just to appear intelligent and superior, than he would with a handful of simple phrases. Githzerai- Ancient blood-kin of the githyanki, the githzerai are a race devoted to introspection and discipline. Because of their ascetic beliefs, they eschew most personal belongings, including weapons. However, for a powerful githzerai, their body and mind are their weapons. When the gith split into the two races of githyanki and githzerai after decades of bloody internecine strife, the githzerai retired to the Elemental Chaos. There they established monasteries, hidden in the calm corners of the plane. Githzerai spend their days training, meditating and reflecting on mysteries of existence. The scars of slavery and strife still run deep within the githzerai and they attack illithids and githyanki on sight, often going out of their way to hunt them. There are a few hidden githzerai monasteries on Atroa, but they rarely interact with other races. The githzerai do recognize a loose family structure, though the quest for personal achievement and perfection often eclipses any familial obligation. Most githzerai children are raised in the monasteries, trained in the ways of a monk from a young age. Githzerai society is structured by merit. Station and respect must be earned. Heroes, leaders, and teachers are immortalized and revered as ancestors, while the unworthy remain lowly and are forgotten. Zerthadlun, an austere walled settlement with many open fields and markets, is the largest and most widely known githzerai city — an oasis of calm in the otherwise tumultuous Elemental Chaos. There the githzerai contemplate order, destiny, entropy, and destruction. They perfect their bodies and minds, testing themselves against the dangers of the Elemental Chaos. The chaos that surrounds them also serves as a source of power. Many githzerai, called elemental forgers, are able to call upon the elements of earth, air, fire, and water in battle regardless of whether or not they are in the Elemental Chaos. The forgers are some of the most powerful practitioners of the monastic tradition and many seek them out for training. 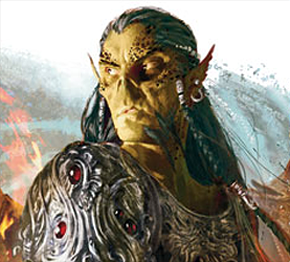 Githzerai appear much the same as their githyanki kin, though are often more gaunt in appearance. Males often shave their heads and females wear their hair cut short or in tight braids. They disdain displays of personal wealth and wear simple clothing. Githzerai are reserved and pragmatic, they rarely own more than they need or say more than what is required. Gnomes- The diminutive fey creatures known as gnomes live a life of comfortable obscurity. Once slaves to the fomorians of the Feydark, gnomes learned that the best way to survive is to be overlooked. Gnomes are sly tricksters with a penchant for illusion. Both curious and cautious, its these traits that allow them to flourish in a world filled with creatures much larger and far more dangerous than they are. Shortly (no pun intended) before the end of the Godswar, before the tumult had settled somewhat in the Feywild, the gnomes executed an elaborate and stealthy escape from their fomorian overlords and fled to the surface from the Feydark. Those that were unable to escape became the corrupted spriggans. Since then, gnomes have learned to stay out of sight when it counts and to let their enemies see only what they want them to see. Gnomes have no great land or city. They live in the quiet places of the Feywild and remote woodlands of Atroa. They live in homes dug among the roots of trees easily overlooked and cleverly disguised by camouflage and illusion. They are fond of the burrowing mammals that share their habitat, such as badgers, foxes, and rabbits, and have a sense of kinship with these small animals that share their forests. Unobtrusiveness is a virtue among the gnomes. They grow up on games of stealth and silence, in which the winner is the last to be discovered. An adult gnome who draws attention in a crowd is considered dangerously rude. Gnome folk heroes are not mighty warriors, but tricksters who slip out of captivity, play great pranks without being detected, or sneak past magical guardians. The Traveler is revered among the gnomes, and it is said that it was the gnomes that were his first worshipers and gave him the symbol of the three-tailed fox. They deflect both aggression and attention with humor, and they guard their thoughts with friendly laughter. Gnomes appear as diminutive eladrin, smaller even than halflings. seldom standing taller than 4 feet in height. They have pointed ears and chiseled facial features. Gnomes have a wilder look than eladrin, though, particularly in the hair that sprouts from their heads in random directions. Some male gnomes grow tufts of hair from their chin, but they otherwise lack any body hair. Gnome skin tone ranges from ruddy tan through woody brown to rocky gray. Their hair can be virtually any color, including bright pink and shamrock green. Their eyes are glittering black orbs. They share the same loves of comfort and family as halflings and, many times, gnome and halfling communities will mesh, appearing as nothing more than a lightly forested roll of hills. Goliaths- Otherwise known as half-giants, goliaths have the stature and strength of their stone giant cousins. Goliaths were created un-naturally by the tieflings of Bael Turath to be a race of strong, stoic warriors. The tieflings mated a human with a stone giant, using a polymorph ritual to compensate for the awkward proportions. Now, goliaths are their own race and flourish particularly well in the Stonemarch Dawnforge and Tyrr mountain ranges. Despite their strength or perhaps because of it, they are still commonly enslaved in parts of Atroa, particularly the southern continent. Like Muls, their power and endurance makes them well suited for hard labor and battle. Nations that practice slavery also tend to have regular gladiatorial exhibitions. Muls and goliaths are the most common gladiators. 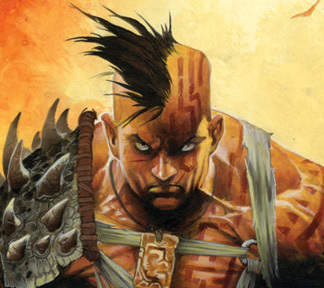 Goliaths resemble tall, powerful humans in proportions, with mottled and rough skin. Their complexion is patterned with darker areas and patches of stone-like callouses. Their eyes are white and pupil-less, ringed with dark circles in their eyelids, much like changelings. Half-Elves- Another hybrid race; half-elves often see themselves as mediators between the elves and humans. When a human and elf, or when two half-elves mate, the result is a half-elf. This often creates an awkward situation for the child; being viewed as a half-breed by both human and elven societies. Some elves or eladrin might shun half-breeds, and some humans might distrust those with elven blood. Although, this also instills a need to find themselves in the wider world. Half-elves generally possess a great sense of individuality. There are no exclusively or predominately half-elven societies on Atroa, though Fairhaven comes close. Half-elves are often as diverse as their human parentage with the wisdom and agility of their elven forebears. Most of the time, half-elves have some indicator of their elven heritage; be it almond-shaped eyes, slightly pointed ears, or both. Though, sometimes, a half-elf will show no sign of either the human or elven parent, appearing either completely human or completely elven. Halflings- Unassuming, garrulous and laid-back are accurate words to describe halflings. They are also steadfast, curious, honorable, and, well, hungry. The halflings of Atroa have always been creatures of appetite, whether it be for food, song, ale, or love. Halflings are considered to be one of the Elder Races of Atroa, yet, unlike elves and dwarves, halflings are thriving, almost more so than humans. When the wee folk first appeared on Atroa is unknown. One day, they were just finally noticed, which is a testament to the low-key nature of the halfling. Their homes and communities blend in with the country-side; a field of rolling hills appears just as such until a closer look reveals small gardens, chimneys, doors and other signs of the halfling warrens. It is thought that the Traveler had a hand in creating the halfling race. Exiled after the Dawn War, the Traveler longed for the feeling of family and comradery that he felt among his fellow dwarven deities and followers. It is said he took up with both Avandra and Melora and, using his wiles, bedded both of them. From this union and the mutual love all three deities had for each other, the halfling race was born. The Traveler released all of his leftover essence of community and home (from his previous portfolio) and instilled it within his children, Melora gave them her lust for life, and Avandra imparted her sense of freedom. This theory is popular among theologians, since it is an origin story steeped not in war, like that of so many other races, but one steeped in love. It also explains how the Traveler went from a deity of hearth and home to that of a rakish thief and trickster. No longer wishing to remain sedentary, the Traveler moved on and eventually made ties with the Raven Queen which persist to this day. Halflings see all three deities as their matrons and patron, even though the Traveler no longer stands for the ideals he instilled in his children. He is popular with halflings who take up a life of adventure or thievery. Halflings appear as short adult humans, around four feet tall, often with slightly chubby features. Some could easily be mistaken for human children, since the males can't even grow facial hair aside from side-burns. They usually have dark hair and eyes, but lighter colors are not uncommon. Their skin has the same tonal range as humans and, like humans, is dependent on heritage and region. The two traits that differentiate halflings from very short humans are their ever so slightly pointed ears (even less so than half-elves) and incredibly hairy feet. 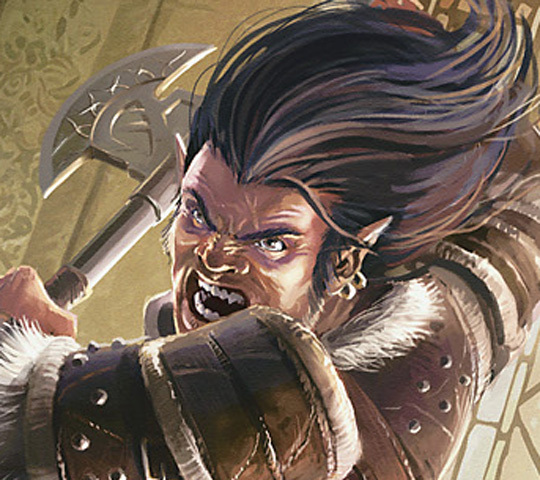 Halflings are proud of their hirsute appendages and they are often dyed or braided and footwear is often eschewed to display these elaborate "hair-dos". Humans- Humans are, by and far, the most prevalent race on Atroa. As the Elder Races of dwarves and elves decline, the age of man is waxing. Humans can be found in just about every society in the world, even in the isolated realm of Iirivaumn there are a handful of humans. Their abundance is due in no small part to their versatility. Humans first appeared on Atroa about one thousand five hundred years ago. Though even those with long memories aren't sure of the exact era in which they first appeared. It is known that they were primitive when first encountered, and that the Elder Races avoided contact with man, considering them dangerous beasts. Theologians speculate that it was Atroa's sacrifice during the Cataclysm that birthed the human race. Her essence melded with the land, and from the land sprang man. Over time, humans evolved, adopting language and tools. Man mastered their environment, and eventually became the race it is today. Human appearances vary from region to region. Diverse even among their own, humans strive for singularity. Kalashtar- Kalashtar are not so much a race as they are an exalted or evolved human. Every so often a kalashtar child is born to human parents; able to speak and think as an adult from a very early age. The parents, most often, will mistake the child for a demon or some other fell creature. The odd physical manifestation of a third eye (centered and above the standard two) doesn't do much to discount these unfounded suspicions, nor does the fact that a kalashtar's eyes glow with an inner, blue-white fire. Sadly, kalashtar born outside a major metropolis will most often be abandoned or killed by the parents. Those left to fend for themselves fair much better than a normal child, being possessed of much more inherent knowledge and intellect. They draw this knowledge from a collective, conscious pool of experience. Every kalashtar who has existed before has contributed to it, simply by living, and every kalashtar alive today continues to do so. Most also exhibit acute psionic talents, including telepathy, around their fifth year. So it is not unlikely, though extremely rare, to encounter a kalashtar adventurer under the age of ten. Kalashtar born in major cities often have their odd behavior and deformities explained to the parents by scholars. In extreme cases, the child is even venerated or worshiped as an avatar to the gods. Kalashtar appear as humans except for a third eye in the center of their forehead (vertically oriented). All three eyes of a kalashtar glow with blue-white radiance. Among their own kalashtar are almost always amiable. Being exceedingly rare, they recognize the need for solidarity. Kalashtar are good almost to a fault, you will almost never encounter an evil kalashtar. Those rare few who do slip are some of the most depraved beings on Atroa. Kenku- These raven-like humanoids first arrived in the Borderlands from the foreign continents in the east around fifty years ago. Whether it was to escape persecution or simply for exploration; they won't say. But, kenkus are as much a nuisance as they are plentiful. The majority of their kind exist in the wilds, usually just outside of popular trade routes in heavily wooded areas or foothills. They prey on the travelers and caravans that run these routes for food and supplies, much like many of the goblinoid races. 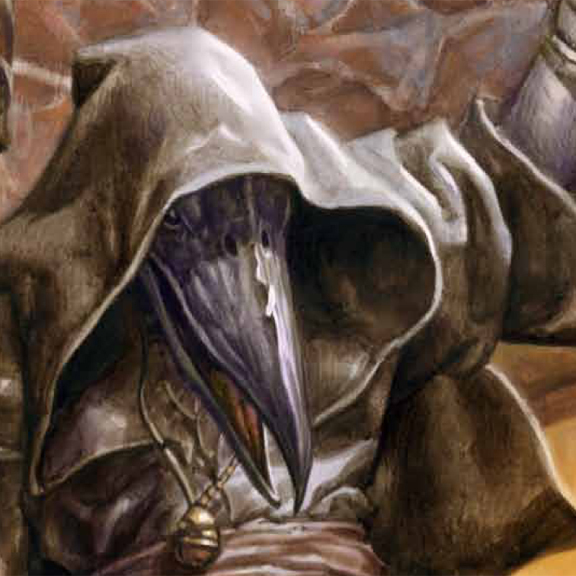 Though, unlike goblins and hobgoblins, kenku are much more clever, and often employ the use of intricate traps and their innate ability to vocally imitate any sound allows them to get very creative. Some tribes simply charge a toll for crossing their lands, using diplomacy and bluster to milk travelers for as much as they can. 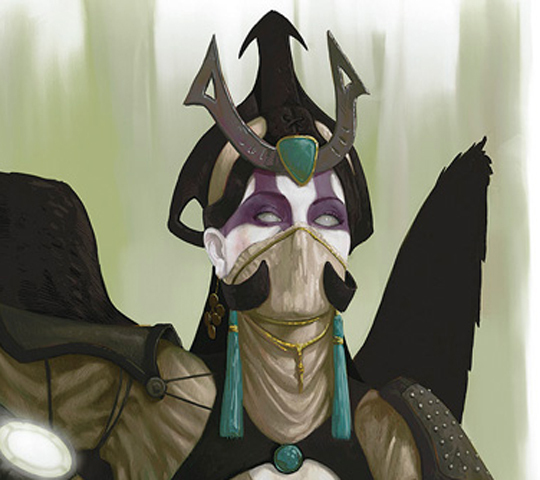 Kenku resemble short humanoids with the head of a large raven. Their hands and feet are coruscated talons with long dark claws. They have feathers that cover most of their body and range in color from stark white to midnight black. Kenku sometimes seek life in a city. Outside of the Borderlands this is almost unheard of. They rarely shirk their devious nature, and those kenku that do exist within a major city are often in the employ of a thieves guild. The rare few that take up "the good fight" are often adventurers. Kenku almost exclusively worship the Traveler or the Raven Queen. Minotaurs- Often viewed as barbaric monsters, minotaurs are rarely accepted in civilized society. Most minotaurs that overcome their savage nature must exist on the fringes of society, or isolated in the wild. The vast majority of their kind view civilization as a weakness that must be destroyed. Minotaurs appear as heavily muscled humans with the head of a bull and cloven hooves. They have thick hair from the top of their head to just below their shoulders where it thins out to human-like hair. It then thickens again about the thighs and loins with tufts of hair at the tip of the tail and around the hooves. Minotaurs often have shaggy hair at the top of their head that trails down their back to their tail. Skin and hair color ranges from albino white to coal black. It is unknown exactly when minotaurs first appeared on Atroa, though their existence in recorded as far back as anyone can remember. They were first created by the powerful demon, Baphomet, to hunt down and kill dwarves in their tunnels. This suggests that they were created some time after the appearance of the dwarven race. This primary purpose is embedded within all minotaurs; not so much hunting dwarves, but stalking tunnels and labyrinths. The labyrinth is a central theme in minotaur culture. They perceive figurative mazes in many aspects of life; from overcoming their bestial nature, to perfecting their talents. Many minotaurs sport labyrinthine tattoos, delineating caste and clan. 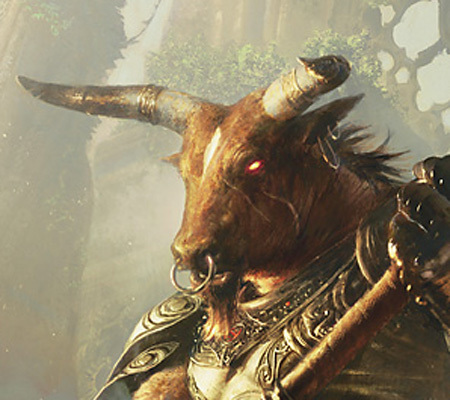 Minotaurs also decorate and dye their horns to show prosperity and status. Below the ruins of Nerath exist many maze-like caverns, just above what most would consider the underdark. The minotaurs played a pivotal role in the fall of the ancient human civilization, attacking from these caverns below the humans' feet. Minotaurs still inhabit these labyrinths and wreak havoc on the countryside. Those minotaurs that are civilized are few and far between, living alone in the wild or under scrutiny in a frontier city. Most civil minotaurs worship Kord, while the majority of the savage ones worship Baphomet or Torog. Muls- Engineered by the depredations of tieflings, Muls were created, not by a god, but by a committee. The tieflings of Bael Turath lived a decadent lifestyle and so the undesirable work was deferred to their slaves. These slaves consisted, generally, of goblinoids. Eventually the efficiency of goblins and kobolds was brought into question and the tieflings began looking at other races to enslave. While humans had the adaptability, they lacked the endurance, and while dwarves had the stamina, they lacked a certain acquiescence. So in an unholy ritual the tieflings mated a human and a dwarf and from this coupling came a mul. Since then, Muls have broken their shackles, somewhat, and become a race of their own. However, their kind is still enslaved in areas like Minz, Ckalle, and even Aranholm. Muls that aren't born into slavery are usually born into a life of battle, whether it be in gladiatorial rings or escaping slavers. They are, to this day, highly prized as slaves and bodyguards. It is this constant strife that has tempered the Muls; they are distrustful, stoic, and hardy. They resemble powerfully built humans in stature, and although they are the result of human and dwarven parentage they are often taller than most humans. Both males and females are completely hairless, though some grow topknots or mohawks of dark, thick hair. 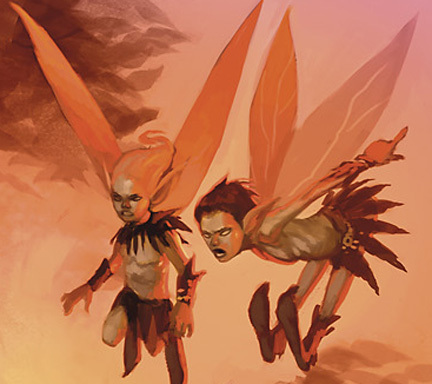 Pixies- An enchanted race born of raw fey magic, pixies are the diminutive fairy folk of the Feywild. Under the direction of the Court of Stars, they etch the patterns of frost on the winter ponds and rouse the buds in springtime. They cause flowers to grow and sparkle with summer dew, and they color the leaves with the blazing hues of autumn. Legends of the mortal realm say that because the Feywild is the bright reflection of the world, pixies are a reflection of humanity. As the bards tell it, whenever a human child is born, a pixie also comes into existence. The personalities of the two races are indistinguishable during the first few years of life. However, human adolescents cast off their childhood ways, while pixies retain them forever. Sometimes pixies feel compassion for mortals who retain a degree of childhood innocence. They often watch over such humans, secretly aiding their "flawed" reflections with magic when they fall on ill circumstances. In the world, pixies were once as prevalent as they were in the Feywild. However, during the years that mortals have ruled, they have diminished and gone into decline. As humanoid civilizations began to flourish, they encroached on the pixies' homelands, pushing the fairy folk back into the Feywild and into the dark unknown beyond civilization. Pixies appear as diminutive eladrin with gossamer wings, standing no taller than a foot. Revenants- The dead given a second chance. Restless souls, cursed to resolve their unrequited lives. Revenants are undead beings granted sentience by a divine force. Most often, the Raven Queen will call a revenant from the grave to serve her means or resolve an important matter relating to the person's life. This practice is not exclusive to the Goddess of the Dead; both Orcus and Vecna have revenants in their service, and its safe to say that they stand opposed to those that serve the Raven Queen. Even Lolth calls her children back from the grave, in a ritual known amongst the drow as 'Zin-Karla'. Revenants aren't from any one specific race. The dead of nearly any race can be called back as a revenant. A revenant appears much as it did in life, yet paler and more sullen. Their eyes may appear clouded and life-less and there may even be evidence of how they died; garish wounds that refuse to heal, yet cause no pain or hindrance. Revenants are rare. Save for Gardusk, there are few places on the material plane with large concentrations of revenants. The Shadowfell metropolis of Gloomwrought holds the largest concentration of revenants within the immediate planar cosmology. Revenants on Atroa must live in secret, especially in civilized areas, as the Church of Erathis views their existence as an abomination. They are regularly hunted by erathan templars. Shadar-kai- Most sages dispute the origins of the Shadar-Kai. Some insist that they are the native inhabitants of the Shadowfell. Others claim that they are the result of the coupling of a human and a shadow (which is ridiculous). The truth lies in devotion; one small village's religious devotion saved them, but transformed them forever. In the primal age of man, when barbarian war-tribes roamed the land that is now Sprohm, the village of Ravenscross sought salvation from the murderous barbarians and fell beasts that roamed the countryside. Their prayers were answered, and the entire village of Ravenscross was plunged into the Shadowfell. At first it was a blessing; under the Raven Queen's protection in the Shadowfell, they didn't have to worry about roving bands of marauders or monsters. But, those that traveled too far from the village found the horrors of the shadowy realm to far outstrip anything they might have faced on Atroa. Eventually the ennui of the Shadowfell suffused their being and they became melancholy, drained of color and vitality. To combat this they became more daring, relying less and less on the Raven Queens protection, and fighting those beasts that they encountered for the sheer thrill. They began to hunt on their own, every time looking for more perilous game, in an effort to stave off the grim depression of the Shadowfell. The structure of the village community broke down as the race flourished and they became more of a barbarous tribe themselves. Their devotion to the Raven Queen persists to this day, and they view her with the most zealous love and respect. Shadar-kai are considered to be the children of the Queen of the Dead. At first glance, shadar-kai appear human. But, a closer look reveals stark differences; glossy black eyes with no discernible whites or pupils, colorless complexions that range from alabaster to dark grey, and hair that is similarly drab ranging from raven black to pale blonde. Shadar-kai also tattoo and pierce their bodies regularly and for many different reasons; decoration, badges of honor, symbols to ward off evil (/good), or simply for the thrill of the sensation. The children of the Raven Queen also dye their hair and dress in splashes of bright colors in defiance to the gloom of their world. The Church of Erathis is somewhat tolerant of shadar-kai, though some sects of templars are more zealous and actively hunt them. Shifters (Longtooth)- The mysterious tribal nomads known as longtooth shifters have a tragic origin on Atroa. Long ago, in the northern lands that are now Dragomir, the Von Dost family were the devoted servants of the Von Zaroviches. For generations, the Von Dosts worked as maidservants, butlers, porters, and any other servile workers in the Von Zarovich castle. Before their corruption, the Von Zaroviches were benevolent masters and treated their servants kindly. After they succumbed to the Shadowfell corruption, however, they became cruel and bloodthirsty taskmasters. Strahd Von Zarovich desired servants to do his bidding in the daylight that were formidable and feared. So, in a fell ritual, they mated a werewolf with a few unfortunate Von Dost maidservants. Within months they gave birth to the first longtooth shifters, dying in the process. The Von Zaroviches had their powerful servants, and within a generation they multiplied exponentially. Unable to control how or when the shifters reproduced proved the Von Zaroviches' big mistake and whole clans of shifters defected into the surrounding countryside. Strahd has since found a way to curb his servants' mating, and still holds a clan or two of shifters under his power. But the majority of them now live in the wilds of the borderlands as nomadic tribes, or amongst the Vistani. 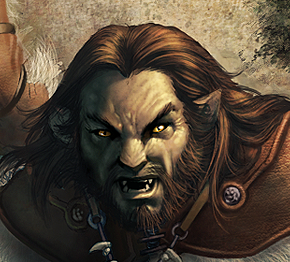 Shifters appear as hirsute humans with vaguely canine-like facial features. They have sharper-than-normal teeth, with pronounced canines, and claw-like fingernails. They often eschew the use of footwear (much like halflings) due to their claw-like toenails. Longtooth shifters often grow thick tufts of fur on their shoulders and upper back, lower legs and forearms, and about their waists. Their skin varies in color, but is most often very dark or tan, and their hair and fur are similarly dark. When they succumb to their lycanthrope nature, their muscles bulge and their fur spreads farther along their bodies. Their faces contort, looking even more lupine. Tieflings- An age or so after the Dawn War, after humans had appeared on Atroa, the empire of Bael Turath rose to prominence. Its prosperity ran parallel to that of the dragonborn nation of Arkhosia and, initially, the two nations were on good terms with one another. The humans of Bael Turath were generally honorable and respected the lands and traditions of their dragonborn allies and those of the Elder Races that warily dealt with humans. However, the succession of rule eventually turned to one human whose avarice and depredation were enough to damn the whole empire. With a close cabinet of like-minded cultists, this khan (whose name has been stricken from history) called upon the devils of the Nine Hells to make a trade for power. The devil made the terms and the khan accepted; the entire nation was to trade its humanity in exchange for hellish arcane knowledge. The humans of Bael Turath had become the first tieflings. In short order, the alliance with Arkhosia became strained and war broke out. 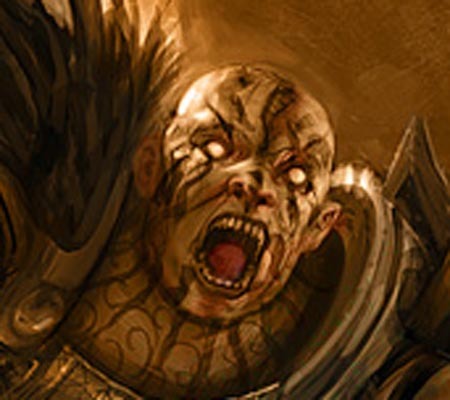 Not only between the tieflings and dragonborn, but anyone whom the nation of Bael Turath viewed as weak enough to subjugate. Tieflings created Muls and Goliaths for their own selfish needs and nearly drove the halfling race to extinction. The empire of Bael Turath eventually fell, catastrophically overreaching its bounds, but the tieflings remained. The actions of one man had damned a portion of the human race, both literally and figuratively. To this day, tieflings bear the stigma of evil, and they are viewed with much distrust. There are a few remnants of the great tiefling empire; Ckalle still practices much of the vile tenants put forth by the first tieflings and is inhabited primarily by the half-devils, and Aranholm, while not nearly as depraved as Ckalle, is a still a testament to the noble tieflings of Bael Turath. Tieflings appear as ruddy-skinned humanoids with horns and tails, much like a devil. Their eyes glow with fiery radiance and their hair tends toward darker hues. Males will often sprout small spines about their jaw-line. 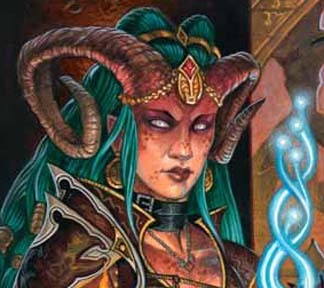 Tieflings are preternaturally intelligent and charismatic, and often take to spell-casting easily. The hellish arcane powers for which the khan bartered have sustained to this day, and sometimes the allure of arcane might is too much for a tiefling to resist. Vryloka- The Vryloka noble family of Dragomir was once a prominent and chivalrous house, on par with that of the rival Von Zarovich family. But, when the Shadowfell called and the Von Zaroviches were corrupted, the Vrylokas saw little escape from the darkness that was claiming the land. Salvation came in the form of a mysterious figure called the Red Witch, a potent sorceress that came to the Vrylokas in their time of need. She gave them the strength and longevity of the vampire without the curse of the hunger, through a ritual called the 'Blood-Bond', but they would be branded forevermore as undead and abominations. They rose to power in Dragomir, nearly deposing the powerful Von Zaroviches, but their human subjects eventually learned the truth of their power and their house was cast down under a superstitious mob. Dragomir is now fully under the undead heel of Strahd Von Zarovich. If the Vrylokas had succeeded in subduing him and his ruling house, perhaps Dragomir would not be the cursed place it is today. The Vrylokas still inhabit Dragomir, though in secret and often amongst the Vistani, and work tirelessly to overthrow the vile Von Zaroviches. The chivalry and honor of the Vryloka family persists in the vryloka race, they possess a strong devotion to family and those they deign to call friends. They have spread beyond the borders of Dragomir, living as nobles in cities like Dunthrane, Aranholm, and Midara, carefully concealing their true nature. They revere the Raven Queen and insist that she and the Red Witch that visited them ages ago are one and the same. This reverence goes beyond simple clerical devotions; it is considered taboo for a vryloka to embrace their vampiric nature and those that do turn to the blood curse are exiled or destroyed by their kin. 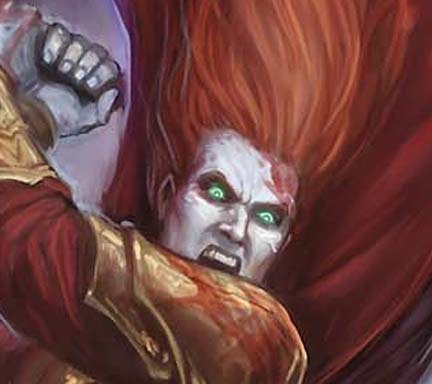 Vrylokas were originally human, but the blood-bond ritual subtly changed their appearance. Their skin is uniformly pale, ranging from pinkish to chalk white. Their hair is fiery red almost to a fault, but occasionally a vryloka is born with jet-black hair. Vrylokas have dark grey or pale blue eyes that glow red or blue when they are excited or angered. Their canine teeth are a little more pronounced than that of a human, but vrylokas have no fangs. They enjoy expensive finery with tones of brass black and red. They incorporate subtle motifs of black-thorn roses on their garb, which they call the symbol of the Red Witch. Considered both living and undead, vrylokas are careful to avoid zealous religious sects like the erathan templars. As of yet, the Church of Erathis is unaware of the existence of the vryloka.